I was working with the perfectly amazing Gina Dunn. One of the excercises she asked me to do was to create a timeline of my working life. I drew a winding road down a A3 sheet of card, and started to mark significant life events along the way. And then it struck me – I have been made redundant no less than 3 times! I started my working life in the north east of England in the 1970’s (yes I am that old) and took a training position with famous razor blade manufacturer. Within 12 months I was out on my ear, the rising popularity of electric razors, difficult economic market (and probably poor management decisions) meant that we, the youngest employees, were disposed of. Honestly, I was devastated. School had not prepared me, at the age of 18, for a rejection as complete as this. Jumping immediately into action I landed a job in the office of a Steelworks. My goodness was that a mistake! Apart from the old and, in fact, obsolete machinery they operated the staff were old and basically obsolete, too. I managed to grit my teeth, smile, do enough to feel I had earned my wage packet, but I had an overwelming feeling of relief when the directors called a general staff meeting and announced that the company was going into liquidation. I had been employed there precisely 10 months. These two events made me determined never to be made redundant again, and I spent my 20’s jumping from job to job, but each time bettering my salary, and gathering a huge amount of experience in different industry branches. I was definitely in demand, so much so that I was eventually offered a position overseas and moved to Europe. Fast forward 20 years and I was working in an international role within a global organisation. I had been pulling a good salary for a long time when the director announced that the offices were going to be relocated but not to worry we were all being offered a relocation package. And I thought about it, I really did. Should I relocate? Or should I stay in my lovely home with my growing family? 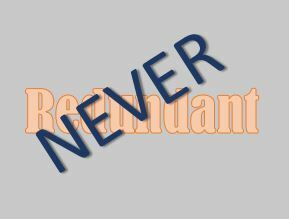 The memory of my first two redundancies came back to me, I remembered my determination never to be made redundant again. And this time I thought – its okay to leave this job – I am not redundant, I never was and I never will be. So I decided not to relocate, and I took my redundancy package. I am so happy that I did. My company, Knowboundaries is established as a top level coaching and training company and among other things I help people find their way back into the workplace. I can do this because I know how it feels; Redundancy has made me feel rejected, relieved, and in the end complete. I guess everyone who is made redundant feels one of those emotions. if you feel the need to talk, just get in touch.